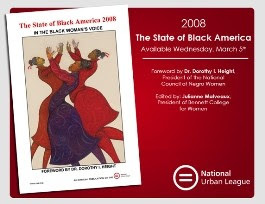 The National Urban Leagues' 2008 edition of the State of Black America is hot off the presses and this year's focus is women. The report, "In the Black Woman's Voice," enlists top female scholars and accomplished thinkers who examine economics, politics and health in Black America. Susan Taylor, former editor of Essence Magazine, Dr. Julianne Malveaux, president of Bennett College for Women and former Secretary of the Department of Labor Alexis Herman weigh in and provide their insight. So the question is why does the report focus on women in particular? According to census statistics 45% of African American households with children are headed by women. This report seeks to expose the tremendous psychological, economic and physical tolls experienced by all black women and propose solutions in the form of public policy and lifestyle changes. The report includes data and statistics which illustrate disparities in income, education and its' impact on the growing wealth gap of African American households. Interesting study. I'm glad they undertook this, but somehow feel outraged by the fact that someone needed the study to corroborate something that's so clearly obvious. Then again, one comes up against a widening perception among non-blacks that things are always better than they were before. I'd like to see a longer term study to see if this sort of retrenchment is a trend, as I suspect it is. x.dell, a longitudinal study would be perfect in this instance, but no one is willing to invest the time or money. Unfortunately the society we live is more willing to put a band aids on gaping, festering wounds, rather than deal with the real problems.